theatre of noise: Tactile Surface Live This Friday! 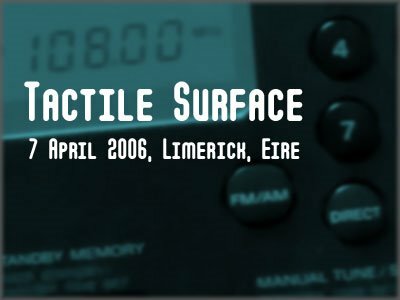 I will be appearing this Friday 7 April at 8pm with John Galvin in our second performance as Tactile Surface. We will be performing "Tectonic Plate II", an improvisation for guitar and radio. This is part of the Mamuska night, held in Daghdha Space, the former Church of St. John's of the Cross in John's Square, Limerick. A Mamuska is an unusual evening of experimentation and creativity, incorporating film, dance, performance art, theatre, music, and more. The friendly atmosphere has always brought out the best in people, both performers and audience, and this week should be no exception. My silence at the last two Mamuska's is now being compensated for. Not only do I have this performance and the just-announced Two Automata, but I am also DJing the night as escalation 275. The next Mamuska is not until June, so come out, come out, one and all!